Dagny's July 2013 Staff Pick: If you haven’t read Anne of Green Gables in a while, or have never read it, I highly recommend it. Anne is an orphan adopted by a brother and sister, Marilla and Matthew, who wanted a boy. Anne, through her persuasiveness and innocence wins them over and changes their lives for the better. This free spirited girl whose imagination is constantly getting her into trouble always carries forward with a smile and hope. One of the most charming and enduring coming-of-age tales! Best-selling Canadian author Lucy Maud Montgomery published the first book in her charming series in 1908, making it a literary favorite for more than a hundred years. Published as a children's novel, the story of Anne Shirley, an orphan, was inspired by the author's childhood adventures on rural Prince Edward Island. It follows Anne's journey as she moves to a farm on Prince Edward Island to live with a middle-aged brother and sister who had intended to adopt a boy to help them with farming chores. The story follows Anne as she makes a home and comes of age on the island. * This chic and inexpensive edition comes with a heat-burnished cover, foil stamping, luxurious endpapers, and a smaller trim size that's easy to hold. * The widely popular novel has sold more than 50 million copies and has been translated into more than twenty languages since its first publication. Anne of Green Gables has been one of the world's most charming coming-of-age stories for more than a century. Classic works of literature with a clean, modern aesthetic! Perfect for both old and new literature fans, the Word Cloud Classics series from Canterbury Classics provides a chic and inexpensive introduction to timeless tales. With a higher production value, including heat burnished covers and foil stamping, these eye-catching, easy-to-hold editions are the perfect gift for students and fans of literature everywhere. Lucy Maud Montgomery (November 30, 1874 – April 24, 1942), was a Canadian author best known for her series of novels beginning with Anne of Green Gables, which was an immediate success. 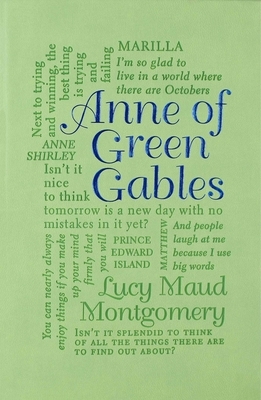 The first novel was followed by a series of sequels with Anne as the central character. Montgomery went on to publish 20 novels as well as 500 short stories and poems. She was born on Prince Edward Island, Canada.